As you might have noticed in my previous blogposts, I'm a pretty big fan of ASOS. I love the simplicity of the site, the brands they offer and the quick and cheap delivery conditions. I check the outlet section on the site weekly and wait as long as possible to make a purchase to get the biggest discount. A bit risky to wait it out, but I always feel great and guiltfree when it works! For some weeks I had been eyeing on these bags from the brand Fiorelli. There were many ones I liked, but my preference went to this beige, snakeskin one. I thought it was a bit more season appropriate than the black ones and also the shape and size seemed more practical. These were the ones I considered buying (and are still available on ASOS.com). And this it the one I purchased. 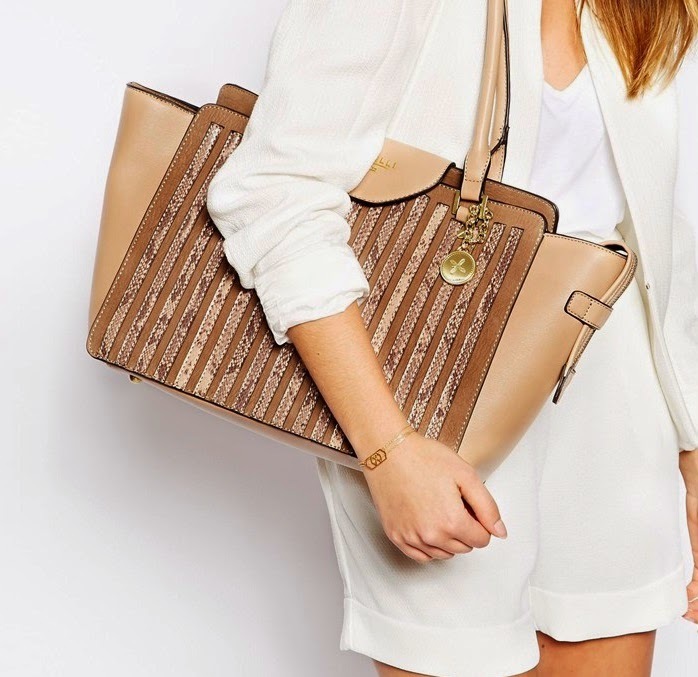 The Fiorelli Bronte Medium Tote Bag, beige, it was originally €105,63 but went down to €84,50. I also got another 20% off because of a coupon code. Definitely subscribe to the ASOS newsletter to receive the latest coupon codes. I've been loving my bag and it basically goes with every outfit thanks to the neutral tones. I'll certainly keep Fiorelli in mind next time I'm shopping for a bag!